Contributed by | OCTOPUZ Inc. Throughout a student’s education, the student is taken through a curriculum that shapes him/her in the best way possible for their career path. Only so much can be covered in the time allotted and it is often difficult for students to pursue their own interests within the field. It is through research projects, such as the ones included in the curriculum at Conestoga College, that students are able to fill that gap between what is taught in lecture and real-world applications. 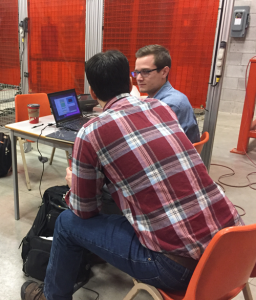 Marko Mateiase, a 3rd year Manufacturing Engineering Welding student from Conestoga College reached out to OCTOPUZ with an idea for his final year research project; He wanted to integrate offline programming with an existing robotic system. In his program’s curriculum has was taught the basic fundamentals of robotic programming, point to point, features and the navigation of different robot programming languages. Marko had never actually worked with an offline programming software for industrial robots. 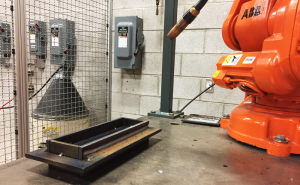 After attending an OCTOPUZ Open House event he discovered a strong interest in the field and expressed his interest in using OCTOPUZ for his research project using an ABB IRB 4 with Fronius TransStreel Welding equipment. One of the first steps of this research was to conduct reach studies. Once the reach studies were conducted, the focus of this project shifted to the creation of multi pass welds. Marko wanted to find a way of generating a multi pass weld that would achieve adequate penetration, meeting or exceeding the performance of a manual welder. The project findings included how drastically offline programming can speed up the teaching process. It can make a complex part very simple to program and it can keep the robot in production while the next part is being programmed; Eliminating down time! According to Marko, the features that he used the most in this project was the Generate Weld Feature which is very customizable. It offers pre-generated weld passes while allowing the programmer to make any necessary changes such as the approach angle. If the programmer would like to generate a custom weld pass, OCTOPUZ gives them the ability to be able to do so. OCTOPUZ provides pre-generated recipes that can be used as is, adjusted or completely re-created. Offline Robot Programming is a technology that is quickly being implemented in manufacturing facilities all over the globe. This implementation results in an increase in efficiency, time and cost savings, and results in less down time. Aside from the improvements in efficiency, offline robot programming also solves a large problem that is making itself evident in the industry, a skills gap. Today’s labour market includes very few skilled laborers, robots can help fill this gap and help meet the labour supply needs. OCTOPUZ is on a mission to helping fill this gap by sponsoring student research projects and hosting events that provide students the opportunity to learn, try and be inspired by offline robotic programming. OCTOPUZ wishes Marko the best for his future endeavors and we thank him for selecting OCTOPUZ as his offline robotic programming and simulation software for this project!